I’m really excited that Chinese New Year is just less than two weeks away. It is the time where we get to catch up with our relatives and friends. And of course, the part that I’m looking forward to is eating lots of yummy food. In recent years, more and more families are choosing to eat out because of convenience and ambience. There are also some that order Chinese New Year Takeaways from restaurants and hotels, to eat at the comfort of their homes. No matter where you are having your reunion dinner, I hope you will have a good time with your loved ones! If you are still looking for a restaurant to celebrate the occasion, let me help you with some suggestions for Chinese New Year Dinner 2012. For a scrumptious seafood feast, go to Chin Huat at Sunset Way for their Chinese New Year Promotion. At $398++ for 10 persons, the set menu comes with Salmon Yu Sheng, Braised Shark’s Fin, Deep-fried Goby, Poached Live Prawns and Steamed Chicken. This Lunar New Year, Executive Chinese Chef Sunny Kong of Mandarin Court Chinese Restaurant has put together 10 different signature menus ranging from the $98++ per person menu (minimum 2 persons) – which features Salmon Yusheng, Braised Shark’s Fin, Steamed Sea Perch, and Braised Baby Abalone; to an extravagant $1,888++ meal for 10 persons, from 13 January to 6 February 2012. From their Chinese New Year Takeaway menu, the prosperity Salmon Yusheng for 8-10 persons is available for $108, while the Pen Cai for 5-8 persons is $368. Over at Man Fu Yuan Intercontinental Hotel, there are 12 different options to cater to everyone’s tastes. The 6 course menu ($108++/pax) – with Yu Sheng, Shark’s Fin, Baby Abalone, Deep-Fried Sea Perch – is ideal for a family of 4. Should you choose to celebrate your Chinese New Year Dinner Party at home, Man Fu Yuan also presents an attractive takeaway package which includes Pen Cai and Yu Sheng at $358 (DBS Credit Card promotion at $320). Chinese New Year Eve, also known as Chu Xi: the day where families gather for reunion dinner. What’s Chinese New Year’s Eve without steamboat? On 22th Jan 2012, Imperial Treasure Steamboat at TripleOne Somerset has created special Chinese New Year set menus. 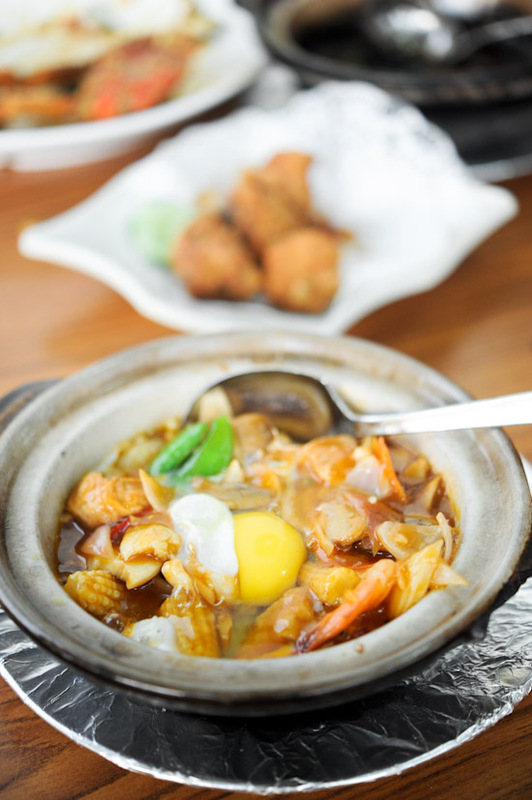 For a family of 4, you can have the $328++ menu which comes with Lo Hei, Seafood, Prawns, Abalones, Scallops, Clams, and Desserts. For those of you who are having an early reunion dinner celebration, the normal set menu for 4 persons is $168++. For a simple reunion dinner, head over to Keng Eng Kee Seafood Restaurant. There are two Chinese New Year Set Menus at $399 and $499 (for 10 pax). For smaller families, you can order from their Cze Char ala carte menu. The last I checked, they are fully booked during Chinese New Year’s Eve. With 11 branches in Singapore, Paradise Inn is the ideal choice for your family reunion dinner. The casual dining restaurant serves good Chinese food at affordable prices. What’s there not to like about Chinese New Year when you get to eat traditional goodies like kueh bangkit, loveletters, pinapple tarts, peanut cookies, and bak kwa? One of my favourite Chinese restaurants in Singapore, Yan Ting at the St Regis is the place to go if money is no object. Yan Ting presents several sumptuous set menus for Chinese New Year 2012. You can choose from the 8 course ($1088++/10pax) which has Salmon Yusheng, Braised Shark’s Fin Soup, Steamed Soon Hock, and Crispy Roasted Chicken; and the 9 course which has Double-boiled Shark’s Fin Soup, Pan-roasted Rack of Lamb, Crispy Peking Duck as the highlights. There’s also the 6 course set menu at $98++/pax (min 2 persons) for smaller families. The Lunar New Year Dinner menus are available from 12th January to 6th February 2012. I cannot believe that you are promoting restaurants that sell shark fin. Shame on you. As a serious food writer, you should be aware that many sharks are endangered and that the practice of shark-finning puts even further pressure what are thinning populations. Further, you should be encouraging people NOT to eat at restaurants that serve shark fin. You should be ashamed of yourself. I hope you will remove or amend this post. I would have to agree with the previous comment. I am a frequent visitor to your website and the very fact that you endorse the consumption of shark fins is highly disappointing. It is a cruel and unsustainable practice that needs to be abolished. I don’t know about you but i’ve certainly lost my appetite. Hi it’s unfortunate that most of restaurants you listed for Chinese New Year has braised sharks’ fin on its menu. Certainly everyone is entitled to their own opinion about what to eat and what not to. However given the influence you have on food readers in singapore, perhaps a caveat should be included on the controversy surrounding the eating of sharks’ fin. Even NTUC has decided to pull off all sharks’ fin products by March of this year and 100 major Chinese companies in China and HK have decided to not have sharks’ fin for CNY this year. There are many non controversial delicacies that we can enjoy for CNY so why not choose to err on the side of safe ethics? Wow! Shark fins soup! I love shark fins soup, especially the ones at Yan Ting! I remembered going to Tokyo and they have this shark fins sushi, which went really well with the whale meat sashimi! Yummy! I think acting like NAZIs when it comes to shark fins is not doing favours to the cause, and might create a backlash. While I choose not to have it, I find it very off putting at the behaviour of anti-shark fin campaigners. One of the examples is here, where Ladyironchef is attacked in this manner. I always believe the carrot is more effective than the stick. Everyone has the cause de celebre, but ramming it down the throat of other is offensive. I think it would be more effective if one politely suggest alternative as replacements and how to ask the restaurants to replace the dish with another etc…. hello people. Where in the first place did you see him promoting shark’s fin soup specifically? He is only giving suggestions on places to go for CNY and these restaurants serve shark fin’s soup as one of their dishes. He didn’t say specifically to ask you readers that you HAVE to order shark’s fin. So please read the entry properly before jumping to conclusions that he is promoting shark fin’s soup. I’m sure he is aware that many singaporeans are protesting against shark fin’s soup. You people can go to the restaurant and request for an alternative. This doesn’t give you the opportunity to backlash on someone who is just trying to give suggestions on the restaurant and the food they serve in general. Likewise, I think it’s a sweeping statement to conclude that ladyironchef is promoting restaurants that sell sharks fin on its menu. Isn’t it unfair to impose your personal opinions about shark-finning on him? As cliche as it may sound, to each his own, really. At the end of the day, it always boils down to choices. Readers will decide for themselves whether to consume sharks fin or not. Just because he mentioned the availability of sharks fin at a restaurant does not mean he’s trying to promote the delicacy, which has cruel origins, but it’s sure as hell yummy. the fins has NO taste, really. It’s the high quality soup base that gives it taste. Like some of us here mentioned, to each his own so let’s save the opinion to ourselves as long as we (shark lovers) do our part by not eating them. I love sharks’ fin soup, especially the one served at Thai Village !!!!! Going this weekend for more !! !